Faced with the never-ending onslaught of convenient cordcutting solutions from competitors, Comcast has decided to take a new tack. The company just announced Xfinity Flex, a little box that lets you stream 4K HDR content (including some free content) from your favorite channels through a selection of apps. You can even use voice controls like “Play Game of Thrones.” The service costs $5 a month. And if that sounds a lot like a crappier version of Roku, that’s because it is a crappier version of Roku. Well, there is one huge difference. In order to use the new Xfinity Flex service, you’ll not only have to pay $5 a month to rent the hardware and pay for the service. You’ll also need to use an Xfinity xFi Gateway, the modem Comcast will also rent to you for a monthly fee, which will probably be about $10 a month. As an added bonus, Comcast says the voice remote that comes with the Xfinity Flex will also let you control other connected devices in your home—cameras, security systems, Xfinity mobile phones—as long as Comcast sold or rented you those devices. So that works out to at least $15 a month for this new cordcutting solution that actually keeps you bound to the biggest cable company in the country. But wait, there’s more. “Flex also will provide customers the ability to seamlessly and instantly upgrade to an X1 video service right from the guide,” Comcast told us in an email. In other words, you could soon get roped into enjoying even more content for even more money. 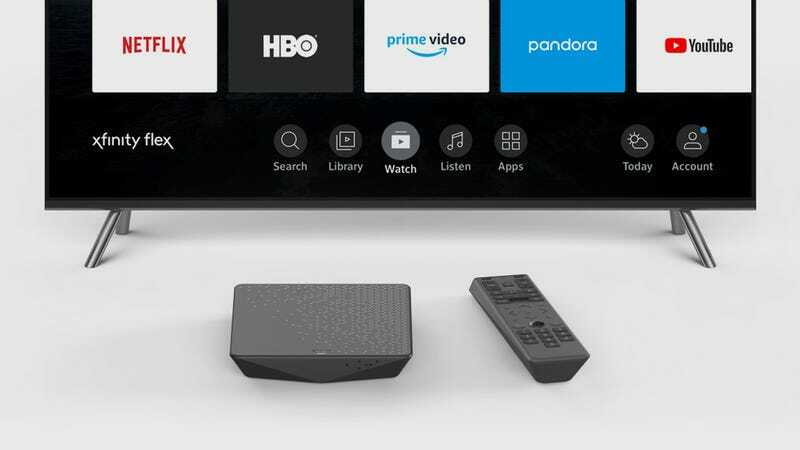 Now is a good time to point out that virtually all of the features offered by the Xfinity Flex system already exist on Roku, Amazon Fire TV, and Apple TV. These devices do not come with a monthly service fee. You can actually buy a Roku Premiere, which also streams 4K HDR content (some of which is free), for a one-time payment of $40. And then you own it! Heck, even a $180 Apple TV seems cheap compared to a $15 monthly fee until infinity. Could they do things like watch Game of Thrones or control a home camera without paying a monthly fee? Absolutely, and that’s what’s so exciting about the state of connected technology right now. You can buy a piece of hardware, like a Roku, and customize it to your heart’s content. Some apps, like HBO, require a subscription, but you can still do a heck of a lot with the device for nothing more than the price of the box. It’s probably worth flagging here that Comcast will still charge you extra for HBO content, even though you’re already paying a fee for the device that will deliver it.